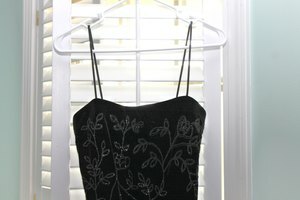 When your outfit of choice is strapless or revealing around the bust area, you might have difficulty concealing a bra. An effective option that gives you the support you desire while staying almost invisible is an adhesive bra that adheres directly to your breasts. Follow the adhesive bra instructions carefully to ensure that your bra stays on your chest and gives you the invisible support you need. Saturate the washcloth with warm water and a small amount of soap. Wash your chest well to remove any skin oils or personal-care products before you apply the adhesive bra. Rinse your skin well with water and then dry with the towel. Take one bra cup in your hands. The cup's inside surface is adhesive and the rounded outside surface is not. Turn the cup inside out so that the adhesive surface of the bra is convex, and then hold the cup so that the rounded adhesive surface is toward your skin. Look in the mirror as you hold the bra cup by the nonadhesive edges (avoid touching the adhesive surface of the cup). Begin to position the adhesive bra cup onto your breast, trying to apply the cup more on the upper portion of your breast than on the lower portion of your breast--the adhesive cups may not cover your breasts entirely. Place the cup over your breast along the bottom edge of the cup first and then smooth it over the top of your breast. As you press the cup to your breast, you will be turning the cup back from its inside-out position and conforming it to the shape of your breast. Press gently over the outer surface of the bra cup with your fingers after applying the cup to remove any wrinkles from the attached bra cup. Apply the second bra cup to your other breast using the same technique. Connect the two bra cups together between your breasts with the plastic clip. Remove the adhesive bra by unhooking the plastic clip and peeling the cups from your breasts from the top edges to the bottom edges. Wash the adhesive bra cups after wearing them. Place the bra cups under warm, running water and add a small amount of hand soap to the bra cup. Rub the adhesive surface lightly with your fingers and then rinse the bra cups thoroughly with warm water. Allow the adhesive bra cups to air dry completely before wearing them again. The Nubra manufacturer recommends saturating a cotton ball with isopropyl alcohol and wiping your breasts with it to remove oils from your skin completely before attaching the bra. If you apply the bra cups incorrectly, peel them off and apply them again. After several application attempts, the bra cups may lose their stickiness. If this occurs, wash the bra cups and allow them to air dry before trying again. What Causes Bra Cups to Pucker?